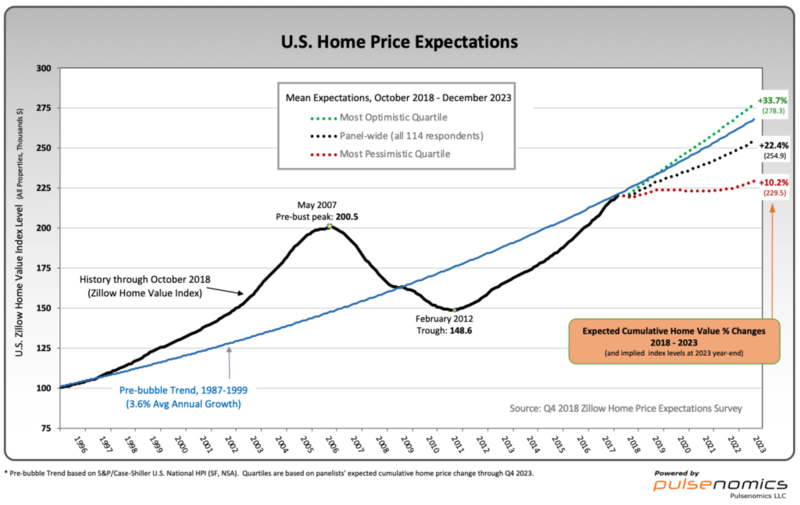 On March 12, 2019, the Zillow Q1 2019 Home Price Expectations Survey results were released. This survey is done on a quarterly basis. 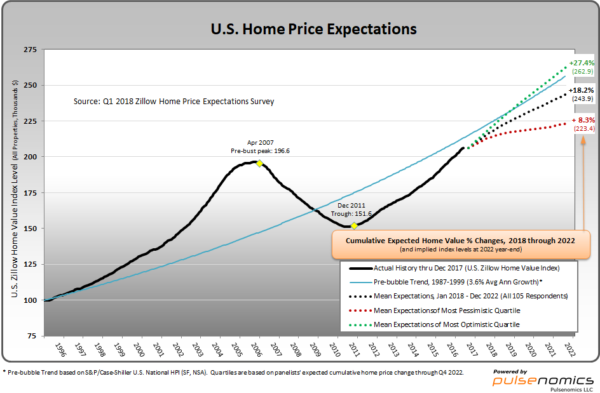 Panelists are also asked each quarter to forecast the performance of U.S. home values. In Q1 2019, they on average predicted a 4.3 percent increase in U.S. home values this year, up from the 3.8 percent rate projected for 2019 just three months ago. 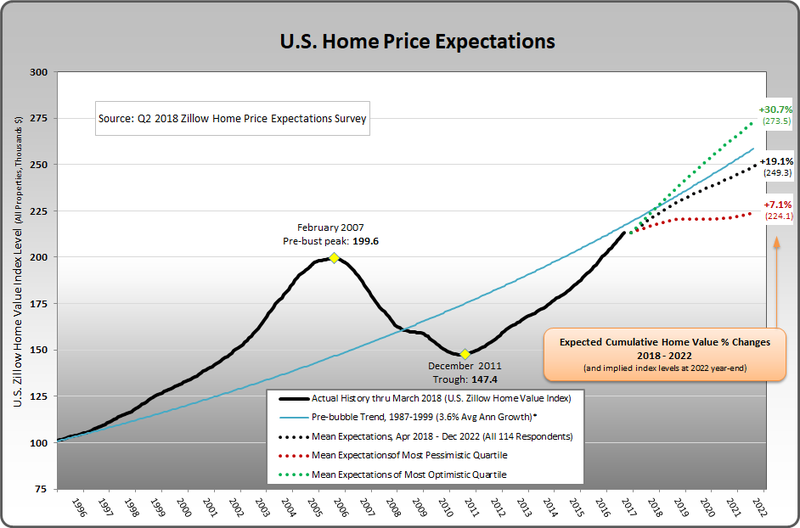 The detail of the Q1 2019 Home Price Expectations Survey is interesting. Of the 100+ survey respondents, only three (of the displayed responses) forecasts a cumulative price decrease through 2023, and none of those forecasts is for a double-digit percentage decline. 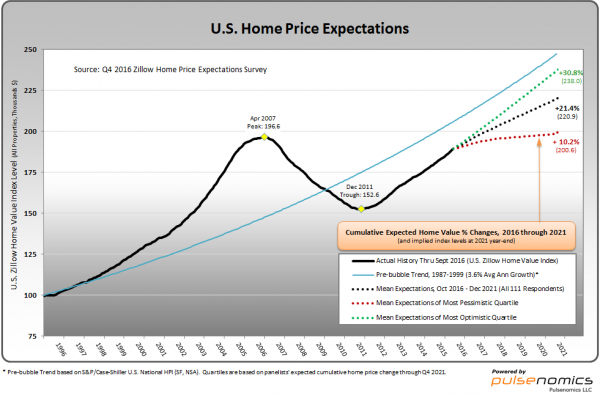 The largest decline is seen as a 7.08% cumulative price decrease through 2023. The Median Cumulative Home Price Appreciation for years 2019-2023 is seen as 4.30%, 7.63%, 10.66%, 14.08%, and 17.62%, respectively. 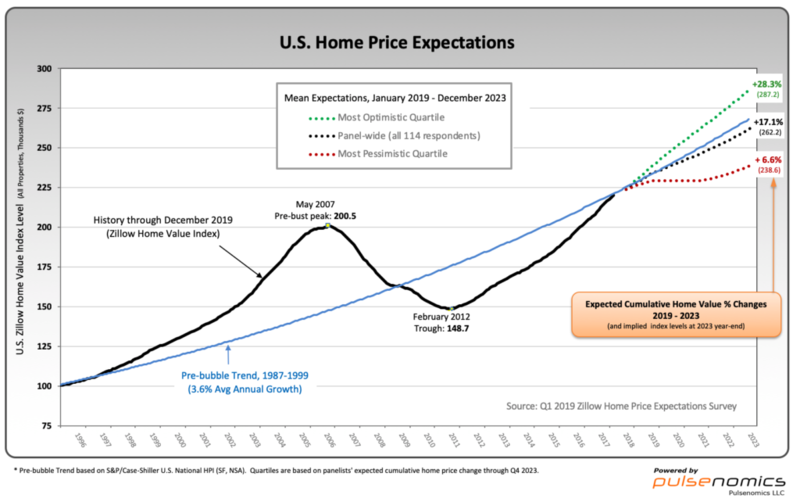 This entry was posted in Real Estate and tagged Real Estate, real estate bubble, residential real estate on March 12, 2019 by Ted Kavadas. On December 4, 2018, the Zillow Q4 2018 Home Price Expectations Survey results were released. This survey is done on a quarterly basis. The detail of the Q4 2018 Home Price Expectations Survey is interesting. Of the 100+ survey respondents, only four (of the displayed responses) forecasts a cumulative price decrease through 2023, and none of those forecasts is for a double-digit percentage decline. The largest decline is seen as a 6.51% cumulative price decrease through 2023. The Median Cumulative Home Price Appreciation for years 2018-2023 is seen as 5.80%, 10.05%, 13.15%, 16.27%, 19.70%, and 23.20%, respectively. This entry was posted in Real Estate and tagged Real Estate, real estate bubble, residential real estate on December 4, 2018 by Ted Kavadas. On May 22, 2018, the Zillow Q2 2018 Home Price Expectations Survey results were released. This survey is done on a quarterly basis. In the meantime, experts think the housing market will continue to experience strong appreciation. They predict U.S. home values will rise 5.5 percent in 2018 to a median of $220,800. At this time last year, predictions were for home values to rise 3.7 percent in 2018. The detail of the Q2 2018 Home Price Expectations Survey (pdf) is interesting. Of the 100+ survey respondents, only five (of the displayed responses) forecasts a cumulative price decrease through 2022, and none of those forecasts is for a double-digit percentage decline. The largest decline is seen as a 7.86% cumulative price decrease through 2022. The Median Cumulative Home Price Appreciation for years 2018-2022 is seen as 5.75%, 10.24%, 13.53%, 16.75%, and 20.46%, respectively. This entry was posted in Real Estate and tagged Real Estate, real estate bubble, residential real estate on May 22, 2018 by Ted Kavadas. On February 20, 2018, the Zillow Q1 2018 Home Price Expectations Survey results were released. This survey is done on a quarterly basis. The quarterly survey, sponsored by Zillow and conducted by Pulsenomics LLC, asked more than 100 housing experts and economists about their expectations for home price growth, and whether tax reform affected these predictions. When asked how the new tax law impacted their five-year forecast for home values in the U.S., 41 percent of respondents said their overall housing outlook is now more pessimistic, while 31 percent of the panelists had a more optimistic view as a result of the tax reform. The remaining 28 percent of respondents said that tax reform did not change their outlook. The detail of the Q1 2018 Home Price Expectations Survey (pdf) is interesting. Of the 105 survey respondents, only three (of the displayed responses) forecasts a cumulative price decrease through 2022, and none of those forecasts is for a double-digit percentage decline. The largest decline is seen as a 4.5% cumulative price decrease through 2022. The Median Cumulative Home Price Appreciation for years 2018-2022 is seen as 5.00%, 9.10%, 12.49%, 15.85%, and 19.33%, respectively. This entry was posted in Real Estate and tagged Real Estate, real estate bubble, residential real estate on February 21, 2018 by Ted Kavadas. On December 5, 2017, the Zillow Q4 2017 Home Price Expectations Survey results were released. This survey is done on a quarterly basis. Panelists views on the pace of home value growth have consistently grown over the past several quarters, likely because of low mortgage rates spurring demand and low inventory constricting supply – a recipe for rapid home value growth that has been in place for the past several years. On average, panelists said they expect home values to end this year up 5.6 percent from the end of 2016 (as of October 2017, median U.S. home values were up 6.5 percent year-over-year. Panelists said they expected home values to end 2018 up 4.13 percent from the end of this year, on average. At the end of 2016, the same panelists said they expected home values to end 2017 up 3.61 percent and 2018 up just 2.97 percent year-over-year, on average. The detail of the Q4 2017 Home Price Expectations Survey (pdf) is interesting. Of the 100+ survey respondents, only two (of the displayed responses) forecasts a cumulative price decrease through 2022, and only one of those forecasts is for a double-digit percentage decline. That forecast is from Mark Hanson, who foresees a 20.52% cumulative price decrease through 2021. The Median Cumulative Home Price Appreciation for years 2017-2022 is seen as 5.60%, 10.25%, 13.65%, 17.13%, 20.55%, and 24.34%, respectively. For a variety of reasons, I continue to believe that even the most “bearish” of these forecasts (as seen in Mark Hanson’s above-referenced forecast) will prove too optimistic in hindsight. From a longer-term historical perspective, such a decline is very mild in light of the wild excesses that occurred over the “bubble” years. This entry was posted in Real Estate and tagged Real Estate, real estate bubble, residential real estate on December 6, 2017 by Ted Kavadas. On August 21, 2017, the Zillow Q3 2017 Home Price Expectations Survey results were released. This survey is done on a quarterly basis. The panelists expect a future recession to have a moderate impact on the U.S. housing market overall, but some markets are more at risk than others. More than 60 percent of experts say the next recession will have a major impact on the San Francisco and Miami housing markets, and at least half predict a major impact in Los Angeles and New York as well. The detail of the Q3 2017 Home Price Expectations Survey (pdf) is interesting. Of the 100+ survey respondents, only five (of the displayed responses) forecasts a cumulative price decrease through 2021, and only one of those forecasts is for a double-digit percentage decline. That forecast is from Mark Hanson, who foresees a 24.47% cumulative price decrease through 2021. The Median Cumulative Home Price Appreciation for years 2017-2021 is seen as 5.00%, 9.22%, 13.01%, 16.22%, and 19.33%, respectively. This entry was posted in Real Estate and tagged Real Estate, real estate bubble, residential real estate on August 21, 2017 by Ted Kavadas. On May 31, 2017, the Zillow Q2 2017 Home Price Expectations Survey results were released. This survey is done on a quarterly basis. 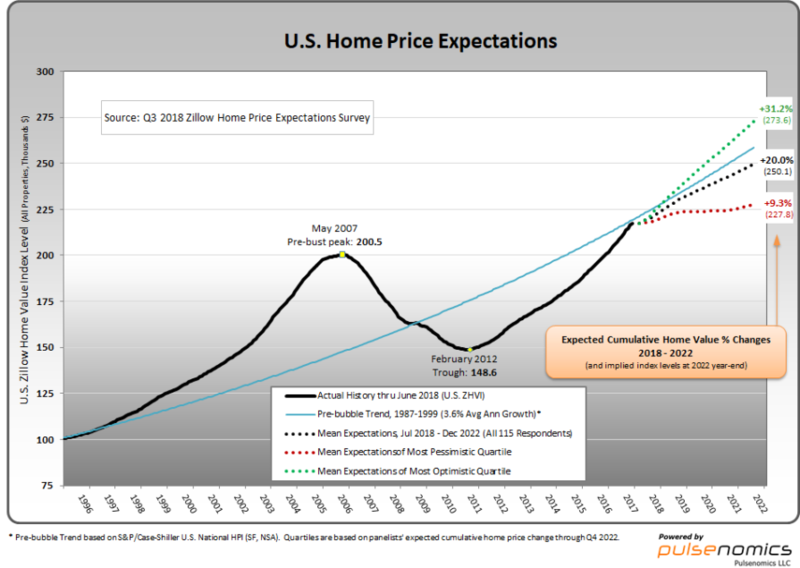 Expectations for overall home price growth are stronger now than they were a year ago. A year ago, panelists predicted that home prices would rise 3.4 percent in 2017. Now, they expect to see a 4.8 percent increase. Their forecasts for home price growth in 2018 are also more optimistic now compared to last year. The detail of the Q2 2017 Home Price Expectations Survey (pdf) is interesting. Of the 100+ survey respondents, only six (of the displayed responses) forecasts a cumulative price decrease through 2021, and only one of those forecasts is for a double-digit percentage decline. That forecast is from Mark Hanson, who foresees a 24.47% cumulative price decrease through 2021. The Median Cumulative Home Price Appreciation for years 2017-2021 is seen as 5.00%, 9.22%, 12.49%, 15.69%, and 18.76%, respectively. 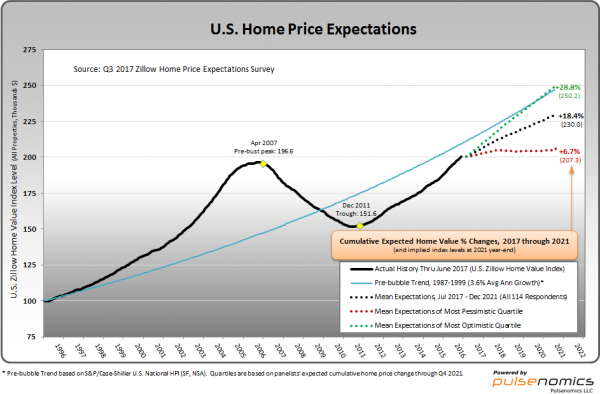 This entry was posted in Real Estate and tagged Real Estate, real estate bubble, residential real estate on May 31, 2017 by Ted Kavadas. On February 10, 2017, the Zillow Q1 2017 Home Price Expectations Survey results were released. This survey is done on a quarterly basis. The quarterly survey, sponsored by Zillow and conducted by Pulsenomics LLC, asked more than 100 housing experts and economists what factors would have the greatest impact on U.S. housing this year. The most frequent answer was rising mortgage rates and their impact on mortgage affordability, with more than half of panelists selecting itii. Home values rose 6.8 percent in 2016. Overall, the experts surveyed predict home prices will rise 4.6 percent in 2017, then slow to 3 percent annual growth by 2019. The detail of the Q1 2017 Home Price Expectations Survey (pdf) is interesting. Of the 100+ survey respondents, only six (of the displayed responses) forecasts a cumulative price decrease through 2021, and only one of those forecasts is for a double-digit percentage decline. That forecast is from Mark Hanson, who foresees a 22.97% cumulative price decrease through 2021. The Median Cumulative Home Price Appreciation for years 2017-2021 is seen as 4.55%, 8.68%, 11.82%, 14.70%, and 18.02% respectively. This entry was posted in Real Estate and tagged Real Estate, real estate bubble, residential real estate on February 10, 2017 by Ted Kavadas. On December 6, 2016, the Zillow Q4 2016 Home Price Expectations Survey results were released. This survey is done on a quarterly basis. Overall, the experts surveyed – which include economists and researchers — said they expect home price appreciation to be at almost 5 percent by the end of 2016, and slow down to 3.6 percent by the end of next year. Zillow forecasts rents across the U.S. to appreciate 1.6 percent from October 2016 to October 2017. The detail of the Q4 2016 Home Price Expectations Survey (pdf) is interesting. Of the 111 survey respondents, only two (of the displayed responses) forecasts a cumulative price decrease through 2021, and only one of those two forecasts is for a double-digit percentage decline. That forecast is from Mark Hanson, who foresees a 24.47% cumulative price decrease through 2021. The Median Cumulative Home Price Appreciation for years 2016-2021 is seen as 4.90%, 8.88%, 12.24%, 15.30%, 18.76%, and 22.32% respectively. This entry was posted in Real Estate and tagged Real Estate, real estate bubble, residential real estate on December 7, 2016 by Ted Kavadas.